Betta fish seem to be a very common pet for small children, and adults alike, since they are often used as prizes for carnival and fair games. They really require little maintenance as far as fish tanks go. The tank can be rather small, and still be a wonderful habitat for a Betta. 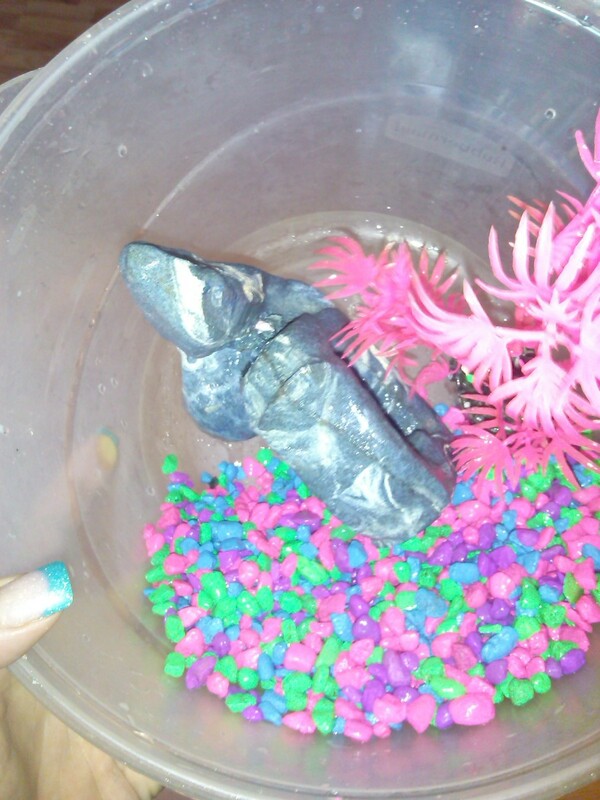 My Betta fish came to me in the form of a birthday gift a few years ago. Dubbed 'Red Fishy' by my son, he has been a wonderful addition to our family. My son who is now 3 is responsible for feeding him, while I do the tank cleaning. 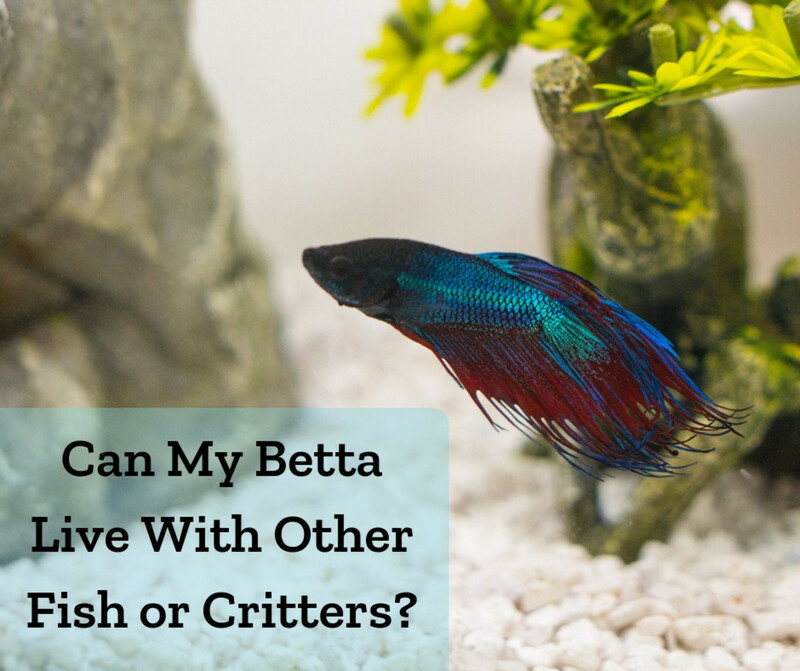 Taking on a betta fish as a pet should not be concerning. 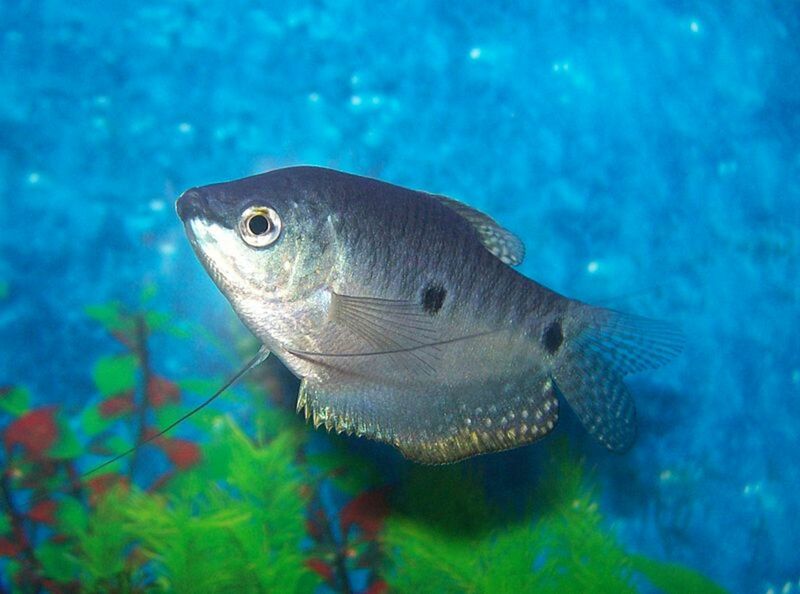 They are easily cared for and very resilient fish. I will show you how to properly clean a fish tank in under 15 minutes. 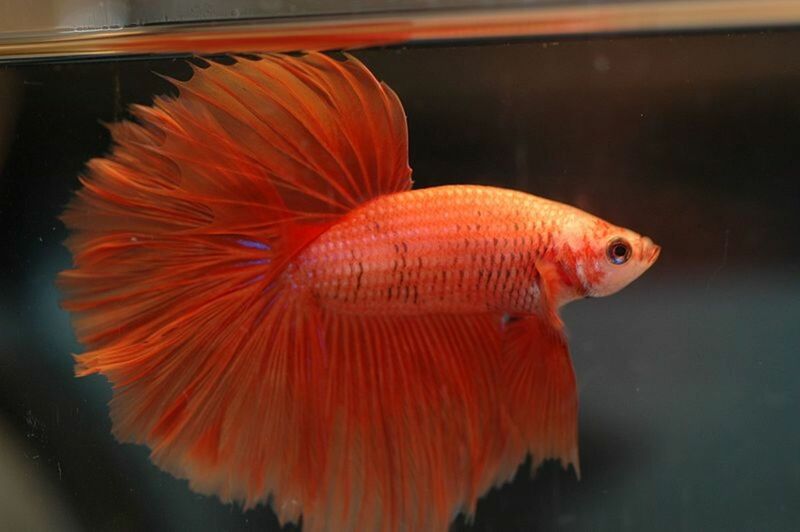 Taking the guesswork out of the fish tank cleaning process may just help you decide to take on a betta fish as a pet. They really are low maintenance, and make a great first pet for children who need to learn the responsibility of pet ownership without taking on a larger pet like a cat or a dog. 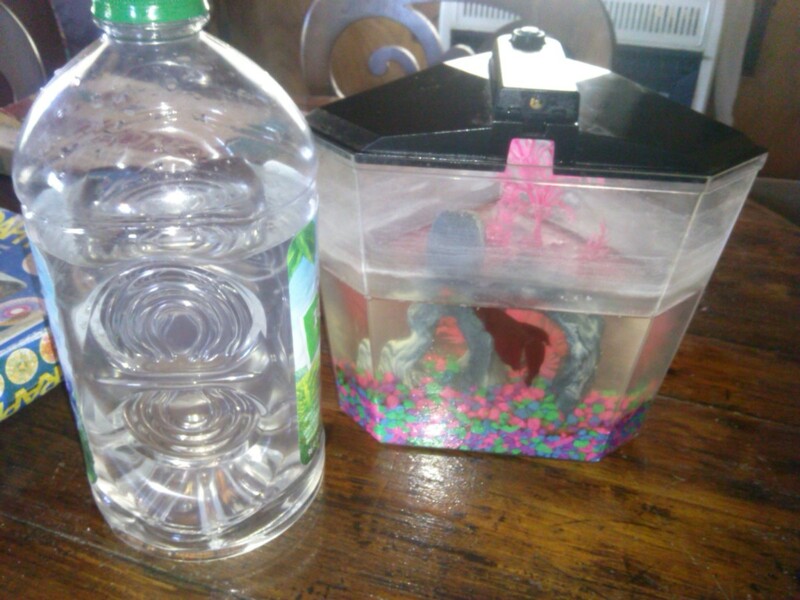 I always fill a clean jug with water the night before I intend to clean my tank. This allows the water to acclimate to the exact temperature of the water in the tank. Otherwise you may run the risk of shocking your betta fish, and possibly causing the fish to die as a result. My water comes from a well. Betta fish prefer a prefer a pH of neutral (7.0) or it can be slightly acidic. 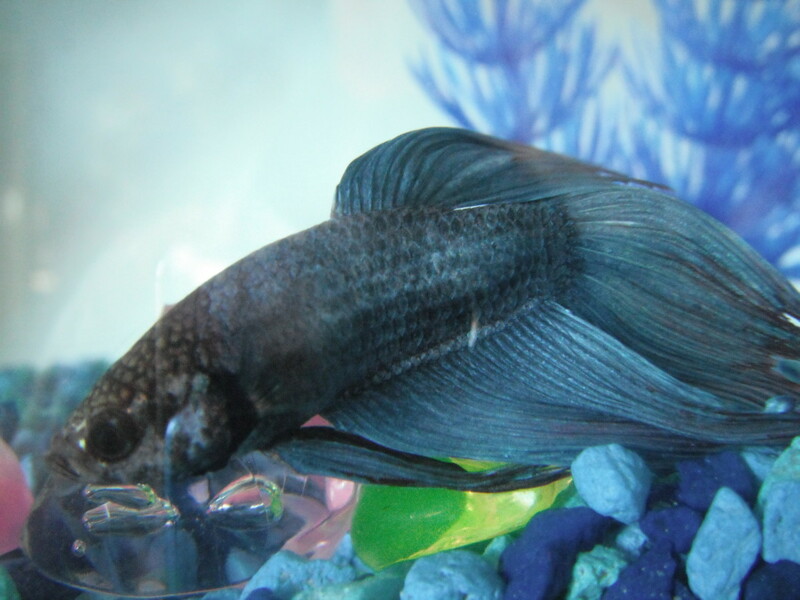 With Betta fish it is not a good idea to chemically alter the ph levels of their water. They can easily adapt to higher ph levels, so long as they are stable. If you have any concerns you can purchase 'Betta Water.' I have found for me it is an unneeded expense. 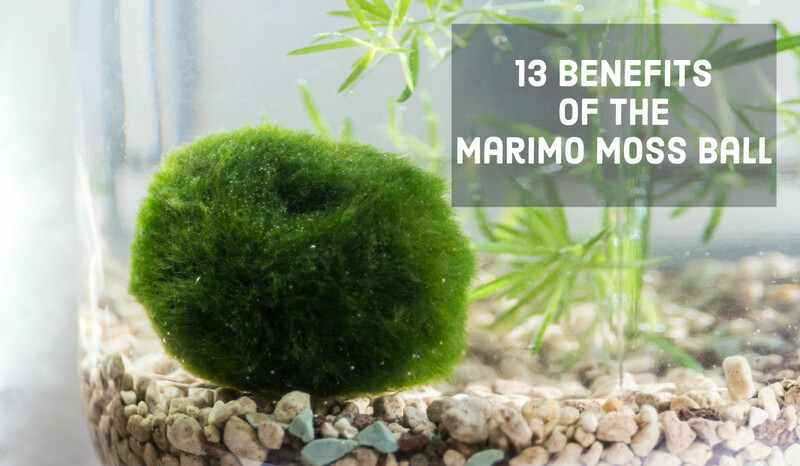 Betta fish are a budget-friendly pet, and even their tanks are very affordable. You can also test the ph levels of your tap water if you have concerns over your ph levels. 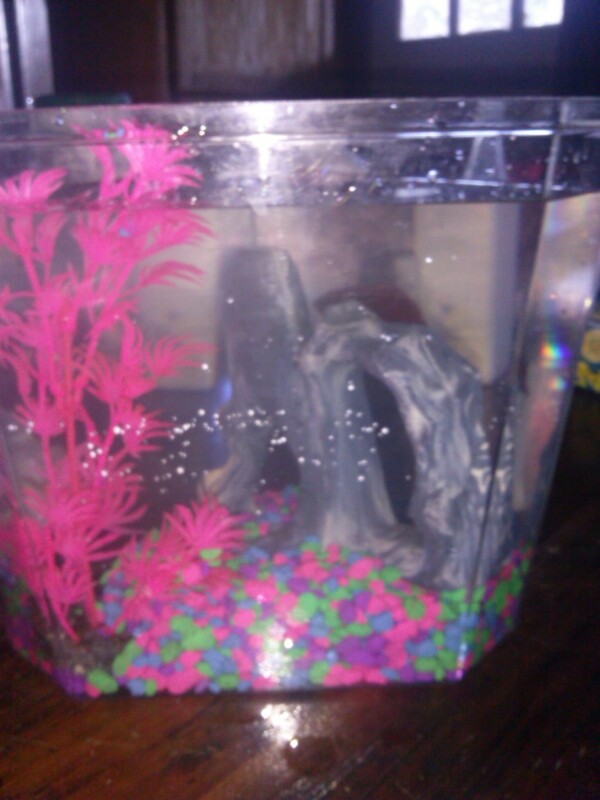 You will need a large bowl or container for the tank accesories and rocks. A bottle brush is less abrasive and a good choice for my acrylic tank. Throughout the years of cleaning my betta fish tank. I find these Munchkin bottle brushes to work best. They are less abrasive than others, yet still have amazing cleaning power. 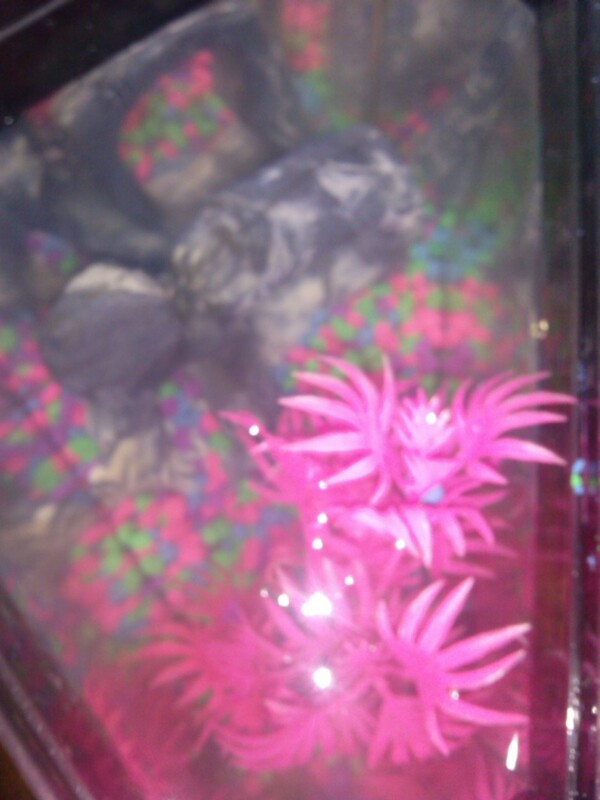 They do not scratch my acrylic fish tank, and are easily sterilized and stored until I need to clean the tank again. Before you can clean the tank, you must first remove the fish. You can purchase a small fish net to remove your betta. 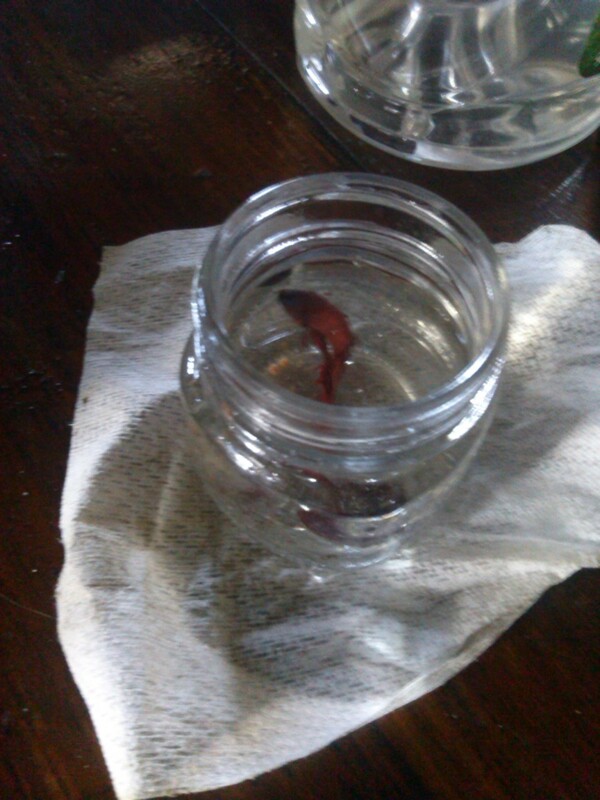 Or you can use a small sterile container like I have and scoop your fish out of the tank. Betta fish can jump out of the water. Once you have removed your betta fish into another container place a small card or sheet of paper over the top. This will prevent your betta from trying to escape. 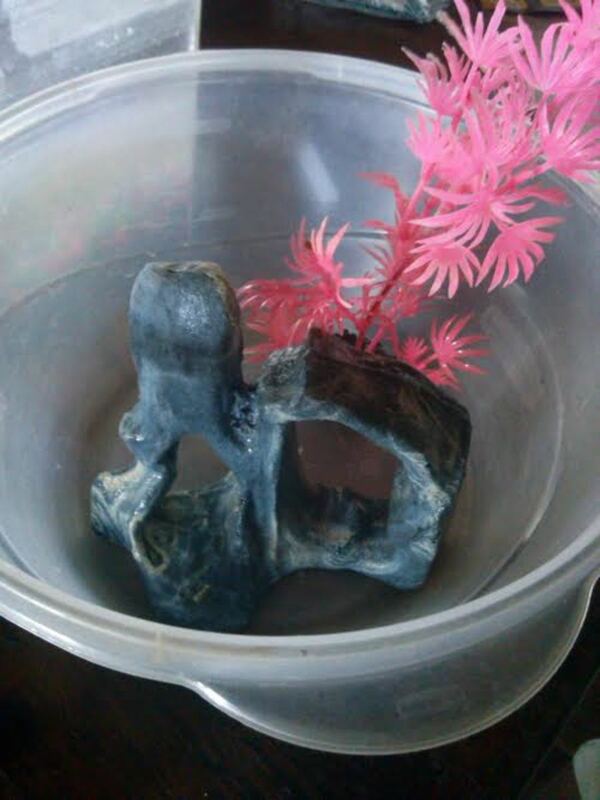 Now that your betta is out of the tank, it is time to remove the decorative accessories that are in your tank and place them in a large bowl. They will need cleaned as well as the rest of the fish tank. Getting them out now makes the rest of the process easier. 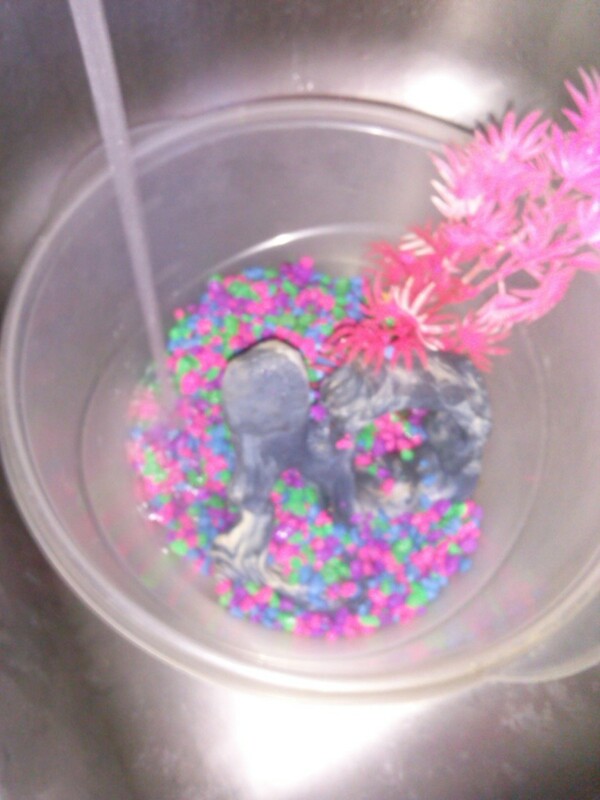 I have a designated plastic bowl that I use for cleaning my fish tank. 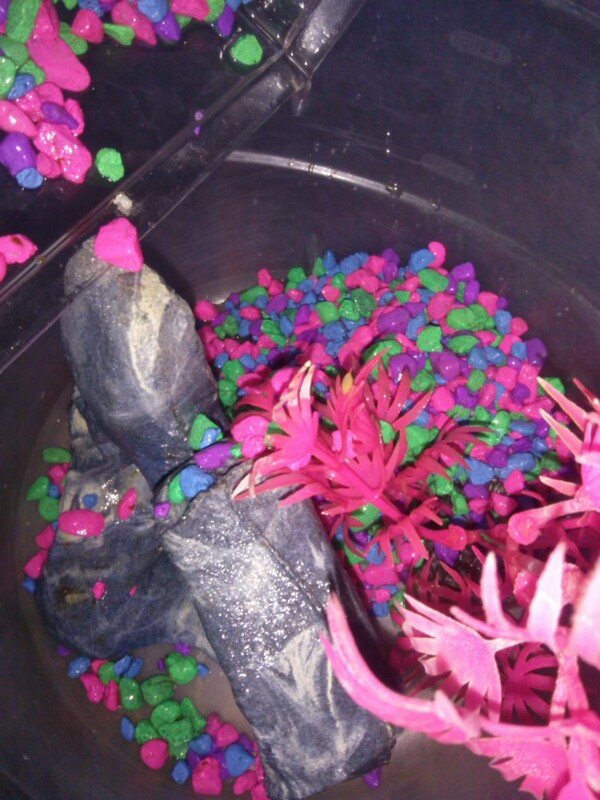 Now that you have removed your Betta and any tank accessories, you should have a fish tank with dirty water, and pebbles if you use them. 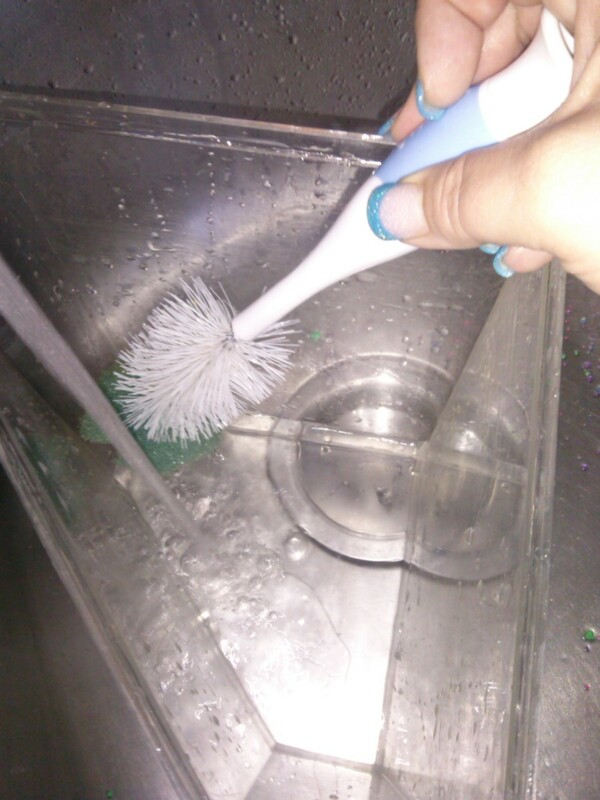 Slowly pour out the dirty fish tank water over your sink. The pebbles being fairly heavy will not cause too many problems while you pour the water out. 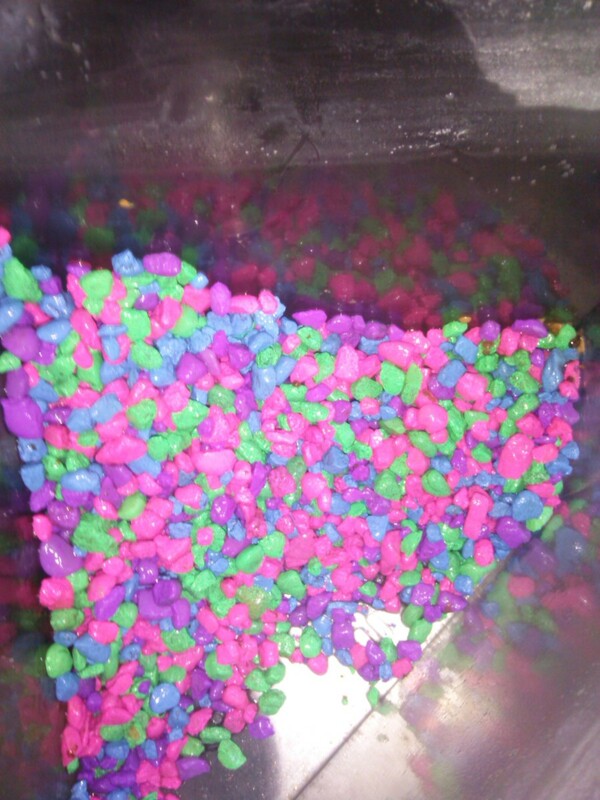 Use caution as you drain the last bit out and your pebbles will still remain in the tank. Once you have successfully drained the dirty fish tank water, you should be left with either an empty tank, or fish tank with only pebbles like I am. If you use pebbles in your tank, pour them over into the bowl with your tank accessories. Now that your accessories and pebbles are in the same container, you can begin cleaning the accessories. 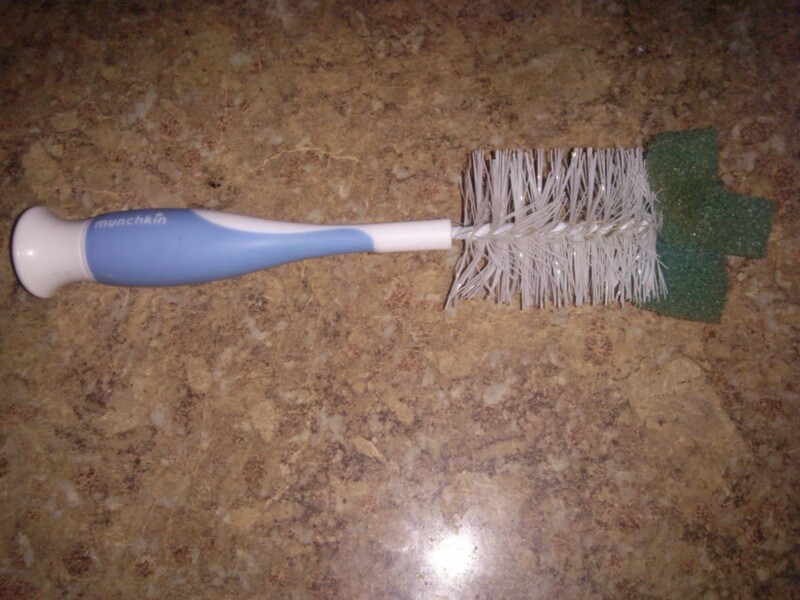 The bottle brush comes in handy for cleaning accessories as it is able to reach areas you would otherwise miss. You should be able to actually feel when your tank accessories are clean. They become slightly slimy to the touch over time as they reside in the tank. If your accessories have built up a large amount of slime you can use a small drop of dish soap. Keep in mind if you choose to use a soap you must make sure that you have completely rinsed the soap off before you can put them back into your tank. If I need to, I will use Dawn dish soap since it is safe for wildlife. It just gives me a little piece of mind that it is safe for use on my betta fish habitat. Cleaning decorative accessories is slightly easier than cleaning the rocks or pebbles that lay in the bottom of the tank. Using my hands under hot running water I rub the rocks and pebbles to loosen the slime and betta food remnants that cling to the rocks. 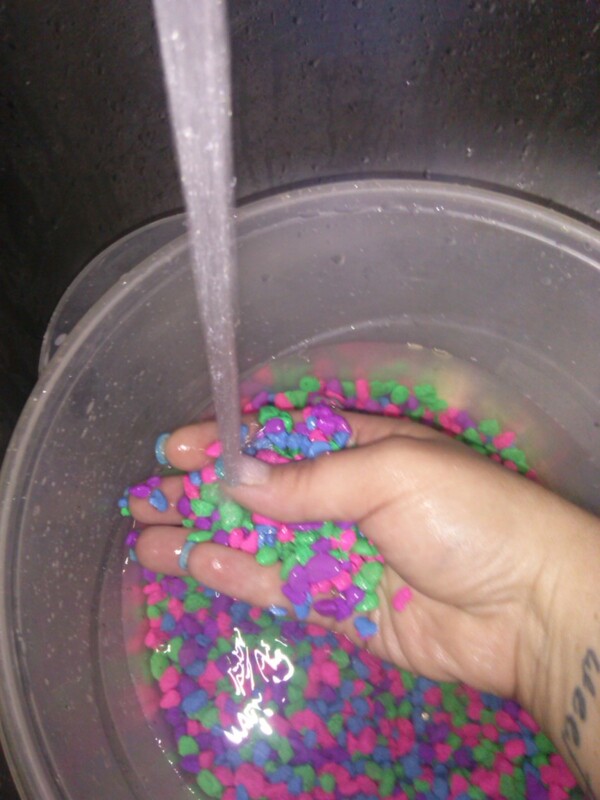 Once I have loosened and ran water through the pebbles I drain the water from the bowl. 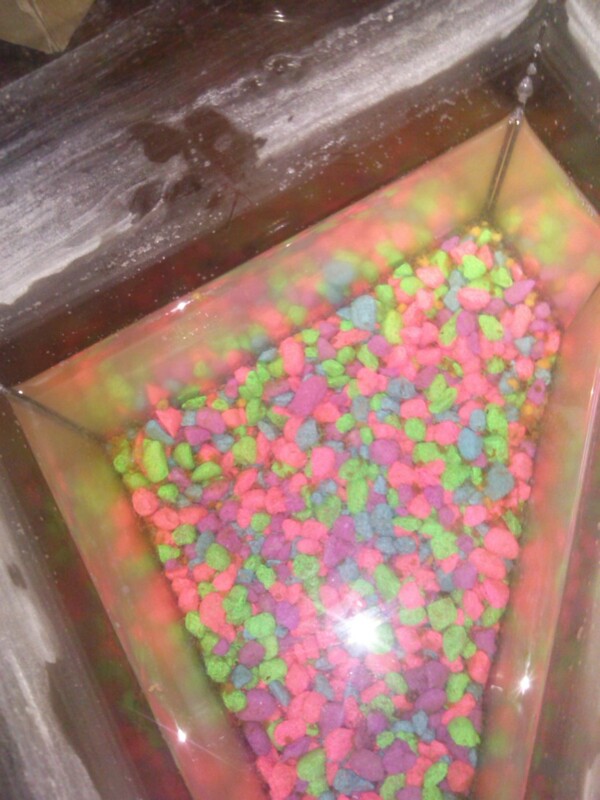 You will no doubt be able to visually see the gunk wash away as you drain the rocks. I repeat the process as long as necessary to remove food remnants and gunk that builds up. Once you are finished drain any remaining water and set aside. Cleaning the acrylic fish tank is actually a breeze. You may find small shards of rock or pebble remnants. These will need to be wiped out with a towel, using caution as the acrylic is prone to scratching. This is a lesson I learned the hard way. Once you have cleaned out any shards of the rocks, place the fish tank under running water, and begin scrubbing with the bottle brush. The bottle brush works exceptionally well in this application; it will get into the corners with ease. It only takes a few moments to give the tank a good clean. If your fish tank has built up a lot of slime they you can use a small amount of dish liquid to help remove it. Use caution to completely rinse it clean, with multiple rinses if necessary. Now that you have cleaned the tank, accessories, and rocks, you are ready to reassemble your betta fish habitat. How you proceed is totally up to you. I generally add the rocks first and then add the accessories. 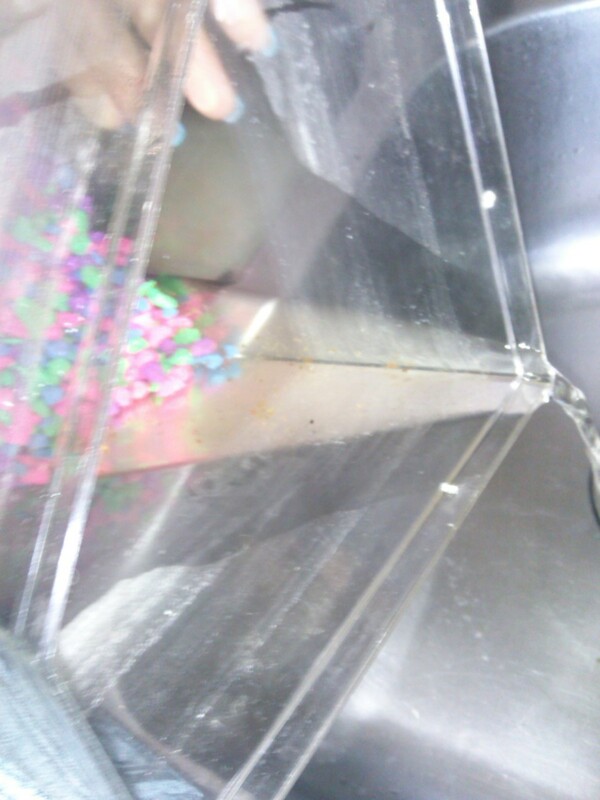 Once I have everything placed, I slowly add the fresh water to the tank. Repositioning the accessories may be necessary if they shift position when you add the water. Congratulations! All the hard work is behind you! Now it is time to reintegrate your betta fish into his fresh clean tank. As you can see there is a fair amount of sediment or debris in the container I put 'Red Fishy' in while I cleaned his tank. 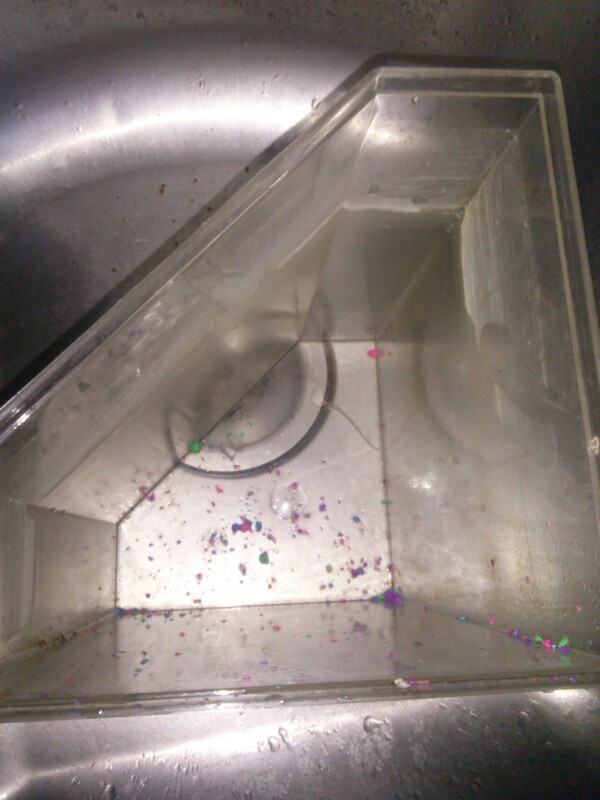 You can easily avoid pouring that back into the freshly cleaned fish tank. Simply tip the container over slightly and try to get your betta to 'go with the flow' so to speak. A betta will generally swim along with the flow of the water. This will allow all the sediment at the bottom to stay there. Once your betta has made the dive from the small container to the fish tank, stop pouring the water to ensure the sediment does not transfer. Betta fish tanks come in all shapes and sizes. 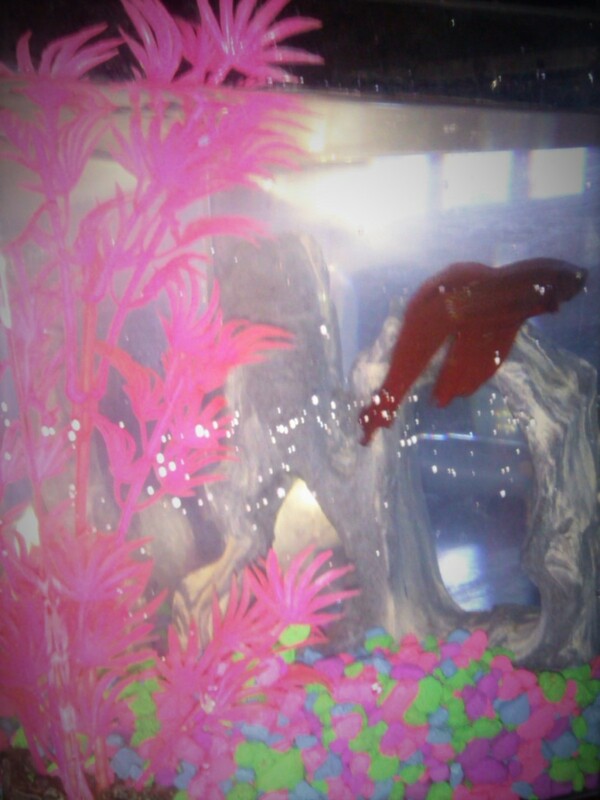 I have been through many different fish tanks in the years we have had 'Red Fishy' as a pet. I find that a larger fish tank like the one I use is actually easier to clean than some of the smaller ones I have used in the past. With a smaller tank you will have a harder time cleaning out the corners. It is just a bit awkward to deal with a small tank. Though betta fish do well in shallow waters, I prefer letting my fish have ample space to swim. A larger fish tank also allows for the addition of accessories, so that your fish has a place to hide if they choose. This is the fish tank we use in our home for 'Red Fishy'. My son loves the color changing light option. I like the design, if needed I can place it in a corner on a shelf away from my cats. My betta fish seems happier since I switched him from a smaller betta tank to a larger one. Though betta fish do well in shallow water, I enjoy being able to have a better view of him as he swims about a larger tank. Is cleaning a betta tank easy? What if my Betta doesn’t like his tank? 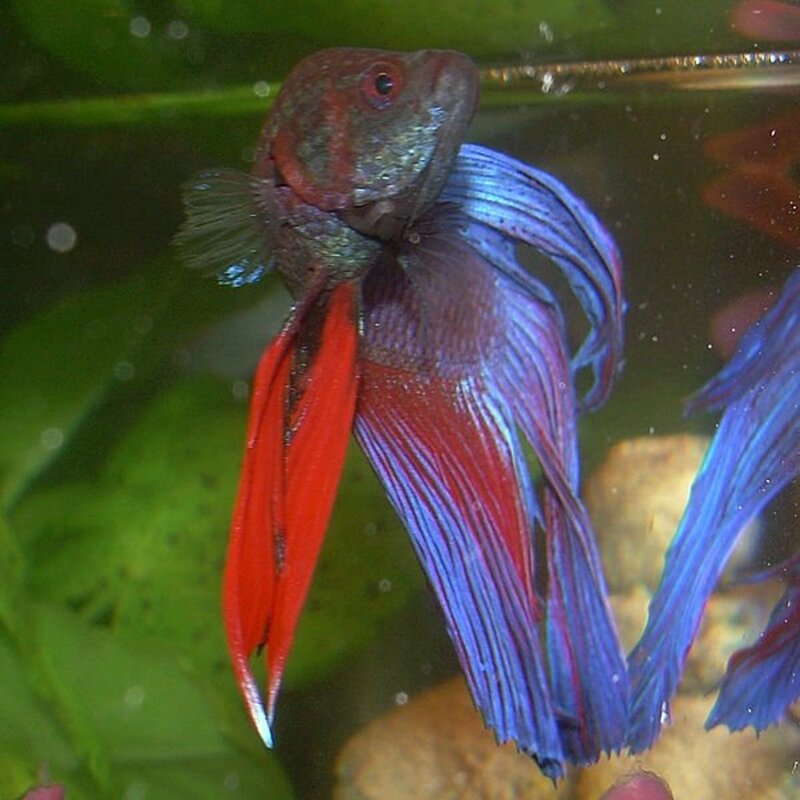 If you feel that your Betta does not like his tank, you may want to examine tanks specifics. It is important to note behavior changes, as it could be something unrelated to your tank that is an issue. It is important that if you're not running a tank filter, that you change the water on a frequent schedule. A Betta in its natural environment is accustom to shallow water. In a tank environment, I do like to provide at least 3 gallons of water. 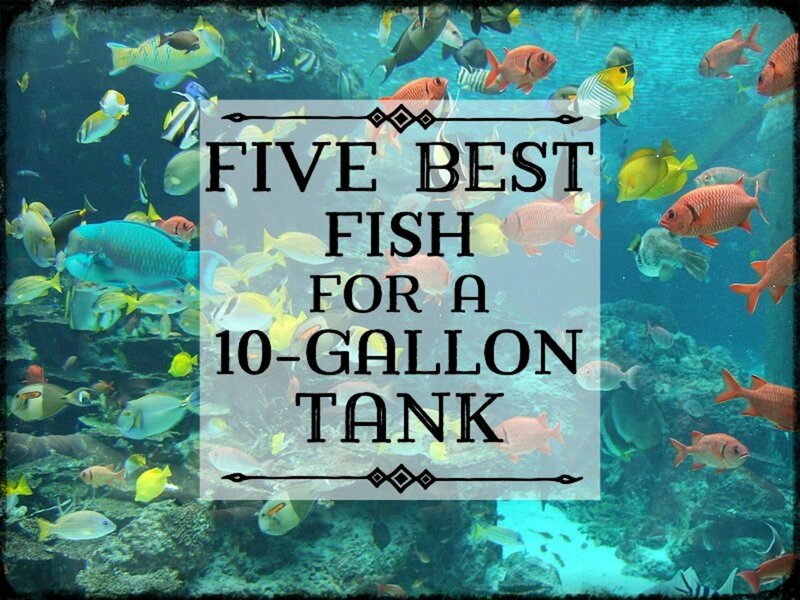 If your using a smaller tank consider a possible upgrade. If you use a bowl, not a tank, these can distort vision for your fish. Checking the PH of the water inside your tank is important to maintain a healthy tank for your Betta as well. Betta fish do seem to enjoy having items in the tank that they can hide in as well. You may try adding a few aquarium decorations like foliage, or a small cave. KAte, thanks for stopping by! 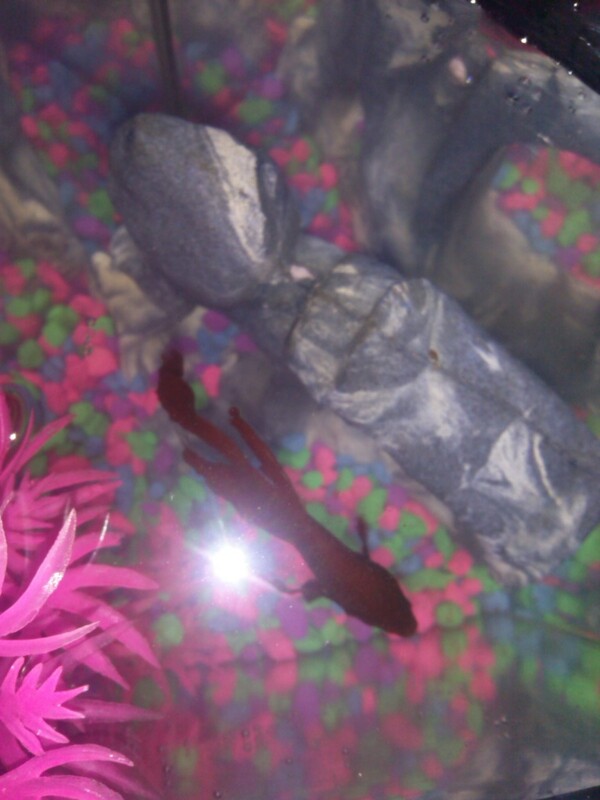 I’ve had red fishy for years now and cleaning the tank and accessories with dawn for all those years never harmed my fish, he remains very healthy and happy. Harsh chemicals would be something I would avoid and suggest others avoid as well. From personal experience Dawn is an effective and animal safe soap and I continue to use it without any issues. I've had my Betta for a year and a half now. 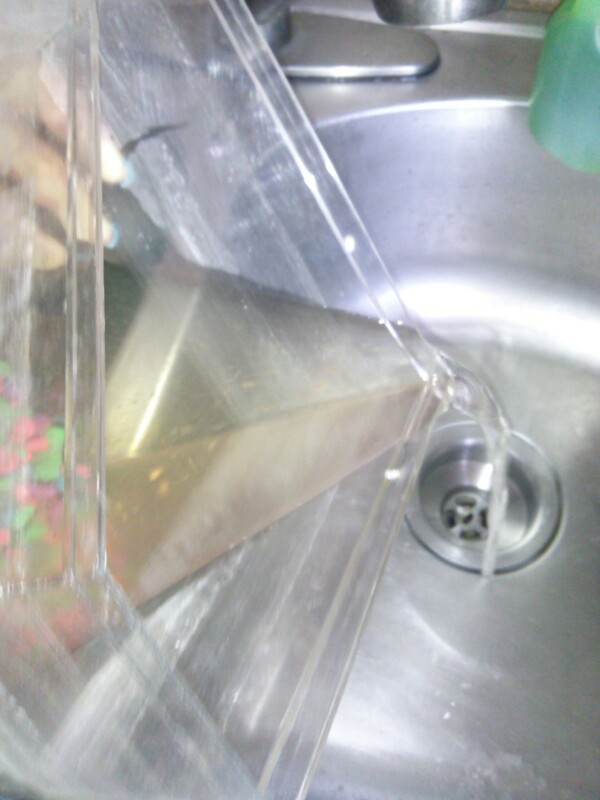 I was told by a veterinarian to NEVER use soap when cleaning the tank and/or accessories, it will kill the fish. In the past 2 months i have purchasef 4 bettas. and the only issue i have is that you have to keep them in separate tanks, bummer. I have a table devoted to my new babies. its my relaxation table. its pretty simple cleaning the tank and accessories , just takes a long time. im so glad i got these lovely little guys. I have 2 veiltails, 1 crowntail and 1(my newest) he's a dumbo half moon . even my cat likes them. i can't believe how smart they are,. they recognize me. and i swear they understand what im saying to them. thankyou for the articles, i am finding them very informative. Thank you Cynthia! Very helpful article; I like the part about getting the fish into the clean water (minus the sediment). Rachel L. Alba I am so glad you found it helpful! Yes they can jump, I always lay something over the container when I move them to clean the tank. I had one of the cute decorative bowls without a top, once I learned we had a jumper my husband quickly got me a better suited tank to keep him in. 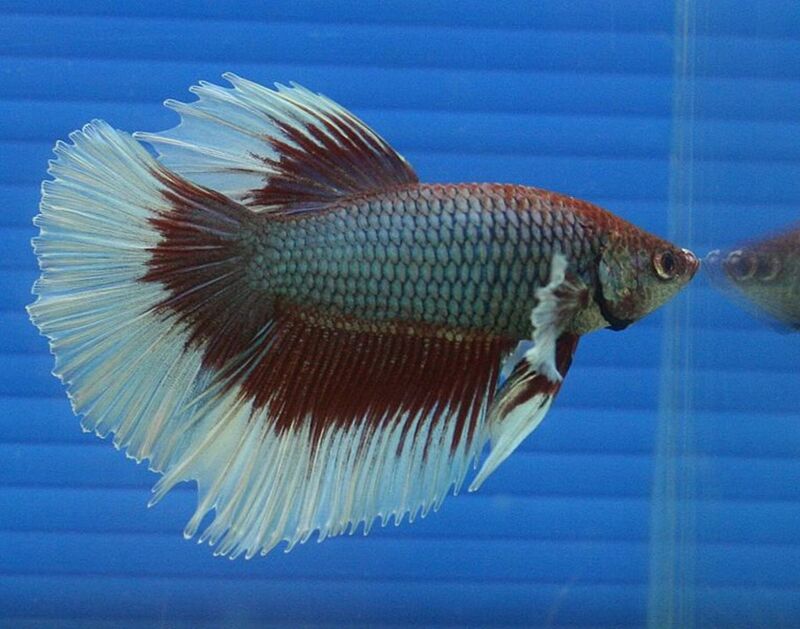 I love Betta fish because they are really low maintenance, and not expensive at all to keep. Hi Cynthia. This hub interested me because I had several Betta fish. I got my first ones on a surprise 40th anniversary my girls gave my husband and me. 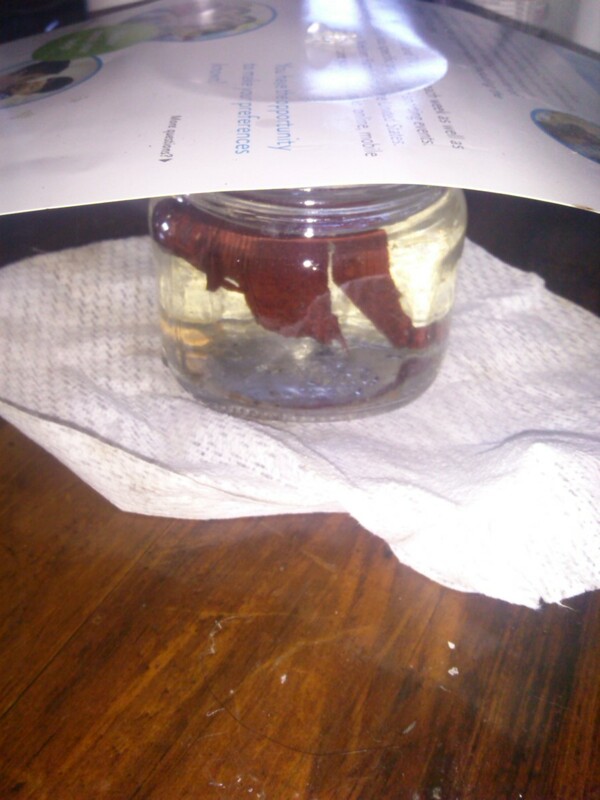 They gave us two red Betta fish. I several after that too. I always was afraid to take them out of the tank. I didn't know they could jump out of the container. lol Now I know. I almost lost them down the sink drain. Thanks for the instructions. Thank you! 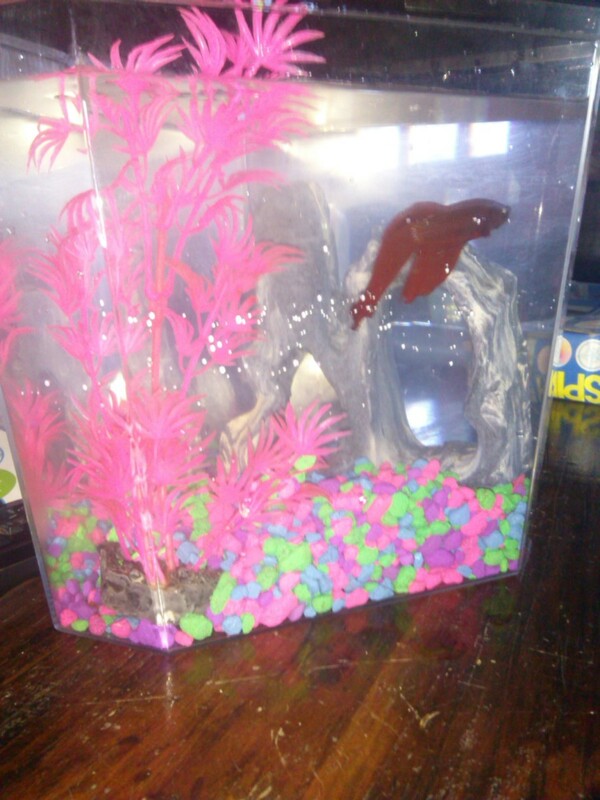 Red Fishy is an absolute joy and my three year old loves taking care of his own pet.